Posted June 21st, 2012 by Ryan & filed under WordPress. I needed to come up with some small project to put together and I needed this for a larger scale project I’m planning, so it was a good fit. Icon added into the media area. The close button actually pushes your JS and CSS back to the main window into a hidden field that’s then saved with the post, and that’s all done via a JS script. It’s also a bit of JS that lets you change tabs. I have a PC with Chrome and Firefox. JS is turned on. Odd. I was using Chrome on a PC when I wrote this plugin. Also thinking maybe it’s an issue of a conflict with another plugin. Doesn’t seem to be that. Tried about half a dozen different FancyBox plugins and none of them caused a problem. My website can be found at http://www.allgäupokal.de (http://www.xn--allgupokal-t5a.de). Perhaps the ä is the problem. Think I see what’s going on, and it is related to FancyBox. But it’s not causing a problem for me so it’s a bit hard to diagnose. Looks like the FancyBox code is loading on the iframe that IJSC pops up, which shouldn’t be happening. I’ll dig a bit and see if I can find why that’s happening. Can you reply and fill in your email address so I can send you a file? I’ve got what I think should fix the issue, but since it was already working on my end I’m not 100% sure. Don’t want to post an update to wp.org if it doesn’t fix the problem, but the fancy box code is no longer showing up on the iframe which I’m pretty sure is the cause of your problem. Thanks for testing and checking where’s the problem. Love the idea of the plugin, trouble is although the CSS is saved along with the page, i dont see the CSS pushed into the head tag on the page… any ideas? When you click to go back to your post, does the little icon change into color? If you click it again is the code still there? How ’bout if you come back and edit the post later? Just trying to narrow down a cause. Hello! Thanks for replying. Yes, the little icon changed to a blueish color. If I click on it, the code is still there. If I come back later to edit, everything is still there. Thanks again! Let me know if you can think of anything else. What theme are y’all using? The hook that this plugin uses to insert the CSS or JS needs the wp_head() function to be called in the theme. I haven’t ever come across a theme that didn’t, but there are a few. What about plugins you’re using? 2011 is the same theme I used when I was writing the plugin, so I assume that’s not the issue. I deactivated all plugins, no diff. I notice the css is included when i am logged in as admin, but not included when i am joe public. Below is the last lines of the head tag for logged in admin, and then joe public. It looks like the query that was looking for either the CSS or JS to include was only looking in posts, and not pages. The version linked should look for CSS or JS in any post type. Yep that works great, do you have a payment link i can donate to you? Thank you both for your commitment to figuring this out. The new plugin works great (as Aaraon stated). Thanks so much for your plugin. It worked perfectly to solve a problem that I’d been pulling my hair out over all morning. Appreciate the help! Best guess would be the collation settings on your database. It probably needs to be UTF-8. I have the same problem with the german umlaute. Did you manage to fix it Wolfgang? Also, de-activating the plugin does not remove the script from any posts that have it applied. I have even found that when I remove the code, it is not removed from the post/page either. It is still applied even after the code is removed from the admin panel. Wondering if editing through quick edit changes the id of the post or something along those lines…. 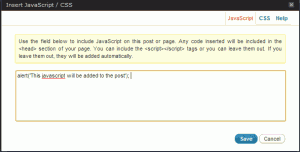 the script or CSS is saved as a meta field for the post so it’s in the database somewhere. Will have to look at what’s happening. I never use quick edit, so I’ve never tested it that way. I have two nearly identical sites. On one, this plugin is working great (thanks! ), but on the other one, I basically get a 404 error when I click on the icon. Any ideas? “basically” a 404. Can you explain what that means? Sounds like one of the files may not have uploaded. What you’re seeing, or not seeing, is loading into an iframe so it’s looking like that file isn’t on your server for some reason. Ok. I’ll try re-uploading (I think I already did try that but it’s been a while, so I could be mistaken). OK. It didn’t work, so I downloaded from scratch and uploaded again. Still the same problem. Not sure what else to try. Anything different on the two sites that you know of, or are they on the same box? i just downloaded your JS and CSS plug-in, looks great, but is there a way for me to add jquery and jquery ui? You’d be better off doing that via the wp_enqueue_script function inside your theme functions.php file. That way it wouldn’t get included more than once. Will you be updating this to be compatible with WP 3.5? Just checked and it works in 3.5. Is it not working for you? Hey! I am trying to make this work today. WP 3.5. I get the admin window, type in my code & click save. Nothing happens. I can click on CSS and help. Cancel works & clicking outside the window takes me back to my post but the code didn’t take. When I click on your window again my code is still there though. for now it work but my code are locate 2 place , homepage and post. i wanna know, if i want to insert code just post only how can i do that. The plugin is great. it works perfectly for me, but I have a problem with the admin panel. I am using a rtl wordpress with the tewnty ten theme but when activating the plugin the admin panel is switching to ltr and the positioning of the different control boxs becomes a mess. Thanks. I’ve been trying to get a swiffy animation on a website for 2 weeks, and your plugin ended up being key to my success. Looks like WordPress filtered out what you were trying to paste in the comment. Haven’t specifically tried the Twitter code. I’ll give it a shot and see what’s happening. And try to put away this Sve button because. I have to take out the plugin. I’m confused. There is nothing related to AdSense in this plugin. Where are you seeing the ad? Ok. It is my fault !! I have discovered that the ad injection plugin was inserting at the footer of your panel to insert the JS the adsense code !!! Sorry for this error. It works fine now for me ! A last one : can you think you can add an option to insert php code ? or is it already possible ? I have just installed the plugin. I have the same problem that others have reported here: The added CSS code does not show up on the page. The site is using the theme “Wedding Bells”. I am using Google Chrome here (though I can’t see that this matters ;-) ). Just tested with the standard theme “Twenty Eleven”. Same problem. Oh, forgot. WordPress is of course latest version. All plugins updated. Doesn’t work. When I click on save or cancel button, nothing happens. Tried on Firefox 21 (win xp) and Chrome 27 (win 7). I need to see java script code only on the page of my post. Not no main page with all posts. Sorry, i dont know how to explain correctly. Your plugin is very useful, but I would like to give you a suggestion to improve it in a little detail I have seen while using it in my own pages. I installed your plugin a while back and its been working well. One of the things I use the plugin for is to insert tracking code on my homepage. I think this problem may have arisen when I updated my wordpress to version 3.5.2. How can I remove this code? – if I disable the plugin the other code I inserted using this plugin will be removed. This plugin is extremely helpful for me. An update I’d love to see is the ability to post either to the head or at the end before the /body tag. Testing scripts from several vendors want it at the bottom of the page. Would be a great help. Sometimes when I go into the CSS editor for a page, then the CSS I previously had disappears. When I go back to the site, without pressing save, it then acts like I deleted the CSS I previously had.